I just returned from Montréal, and in preparation for my trip there, I researched their local Lululemons. Why? Well, if you think Lululemon is only a high-end athletic brand, think again! Lululemons all across the world offer free fitness classes for the local community. Lulu in Montréal hosted a sub-festival within a festival (honestly the entire city was one big festival!) of a variety of fitness classes in Le Parc de Portugal. #ProTravelTip! I clearly got lucky to be in Montréal at the right time to participate in their fitness festival! Otherwise, I would have just attended one of the store’s weekly fitness classes. A great majority of lulus in New York are either run clubs or yoga meet-ups – which is great considering running through Central Park is AMAZING – but I’m more of a HIIT (high intensity interval training)/bootcamp kinda gal! Because of that, I am loyal to the Lululemon SoHo store because of their incredible “Workout Wednesdays.” Nearly every Wednesday they close down the store for shopping, clear the merchandise, and transform the store into a fitness studio! 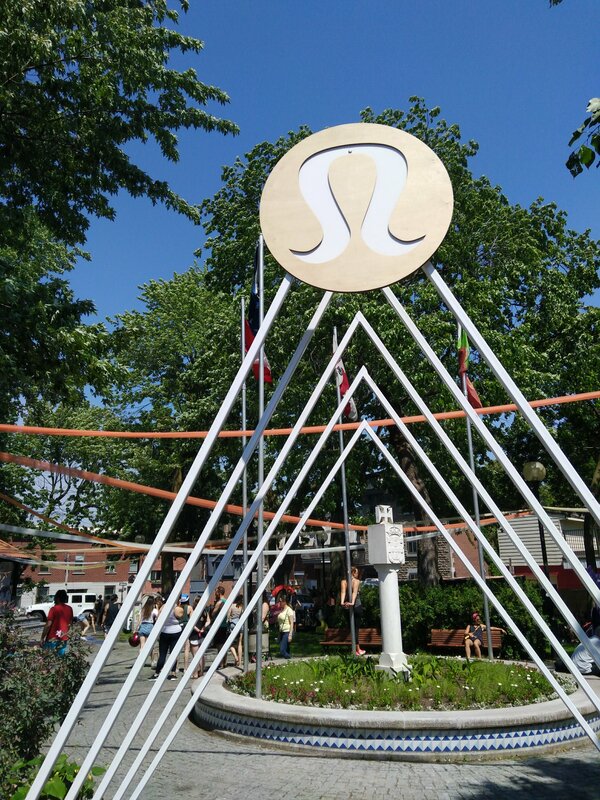 Lululemon New York is offering free outdoor workout classes each Tuesday and Wednesday throughout the summer! You have to RSVP in advance for each session. Here you can find out more info and sign up! The weather will determine which Lulu class I’ll be taking Wednesdays. My two amazing gal pals gave me a great birthday gift – my first pair of Lululemon leggings, which I can’t wait to wear to my next #WorkoutWednesday! Let me know if you want to workout with me & lulu! Next Post Free yoga + rooftop + #views? Yes please! Okay ladies, let's get INFORMATION🧠 Did you know Jay-Z created his name from his subway lines, the J & Z trains? 🤯 Although @danichain & I may look like we are droppin' the hottest mixtape the subway eva seen, I'll save that for transit lover Jay-Z, as I'm more of an #IGLive kinda gal 🤓 TOMMOROW NIGHT @ 8PM EST, I am bringing in my favorite transit reporter (& subway expert millennial) AARON GORDON to talk everything #MTACRISIS, #fixthesubway, #LTrainShutdownShutdown, #congestionpricing, #fairfares, & all the other topics + questions you have been wanting to know more about🚇 Who's tuning in?! Let me know👇 so I can give you a shout out! I got 99 problems but being #CarFree ain't one 💁 As someone who keeps a tight schedule traveling all over the city daily, I rely heavily on the buses for a bulk of my #onabudget & timely movement. Here are some of my best tips: ⠀⠀⠀⠀⠀⠀⠀⠀⠀ ⭐ USE @citymapper & ONLY TRUST "LIVE TIMES." If the bus says "5 min," that is the live time + means it's the distance of 5 min away. If it says "10:47pm," that is the SCHEDULED time & the bus is still at the depot, not yet en route. This is an important distinction! The bus schedule is why I have trust issues. 🙃 ⠀⠀⠀⠀⠀⠀⠀⠀⠀ ⭐ BLESS THE SBS. The Select Bus Service has a) faster boarding (all door boarding AND pre-boarding payment), b) typically has a designated bus lane, c) makes fewer stops, and d) is typically the quickest way to get crosstown (east/west). ⠀⠀⠀⠀⠀⠀⠀⠀⠀ ⭐ NO SUBWAY? NO PROBLEM. The best bus routes in my routine are where the subway doesn't serve. For instance, I take the B60 for my Bushwick fun, the B48 to Greenpoint, the M79SBS & M86SBS to get between the UWS-UES. ⠀⠀⠀⠀⠀⠀⠀⠀⠀ One time, out of why-not? attitude, I took the M79SBS🚌 to the UES + a cab🚕 back to the UWS - yo, the cab took more than DOUBLE the amount of time + it wasn't even rush hour! So, as a reminder, you can save MONEY & TIME by taking the bus. 🔻 How often do you ride buses? It's a lovely day to have a lovely day!! There are SO many new piers & parks open along the East River Greenway b/w Two Bridges & Wall Street. I *highly* recommend taking a long stroll along the waterfront & checking out all the lovely new spots! 😍 ⠀⠀⠀⠀⠀⠀⠀⠀⠀ ⭐HOW TO PLAN YOUR ADVENTURE: take the J/M to Delancey and walk east along Clinton Street OR take the F to 2nd Ave and walk along Rutgers Street. Just keep walking past South Street - the Greenway & parks start underneath the FDR overpass. (Side note: I've been wanting to try @scarrspizza for a while, which is en route to the first Pier Park. Could be a good idea to get a pie & bring it to one of the picnic tables!🍕) ⠀⠀⠀⠀⠀⠀⠀⠀⠀ ☀️Enjoy! Where are you spending your day in the sunshine? How to Be Broke On Your Birthday! Free workout TONIGHT in SoHo!